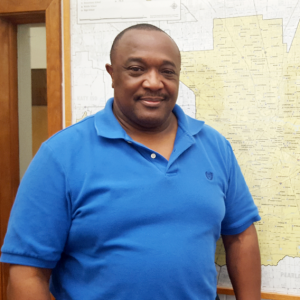 When Hurricane Harvey hit, Facilities Services Security Maintenance Dispatcher Kenneth Johnson left behind his home and relocated to the Hattie Mae White Educational Support Center, where he could monitor and serve the district. As the flood waters rose, some HISD locations lost their security camera feeds, but Johnson kept calm and helped organize response logistics, which included determining where to send technicians for maintenance. This entry was posted in Business Operations, Facilities Services, News and tagged Facilities, Facilities Services, Hurricane Harvey on August 25, 2018 by HISD Communications. Thomas Middle School is getting a facelift this summer thanks to the help of the Houston Independent School District Facilities Services team. The school is being updated to accommodate incoming middle school students from Woodson, which is transitioning this summer from a prekindergarten through eighth-grade campus to a prekindergarten through fifth-grade academy. This entry was posted in Business Operations, District IV - Jolanda Jones, News and tagged business operations, Facilities, Facilities Services, Thomas MS on July 20, 2018 by HISD Communications. In the wake of historic flooding across the Houston area this week, the HISD community has rallied to help in a number of ways, including assisting with the bus evacuations of residents in the Greenspoint area and setting up two school-based shelters on a moment’s notice. This entry was posted in District II - Rhonda Skillern Jones, District IV - Jolanda Jones, District V - Sue Deigaard, News, Transportation, Weather and tagged Facilities, Johnston Middle School, M.C. Williams Middle School on April 20, 2016 by HISD Communications. The HISD Board of Education will receive a report Thursday that updates the district’s long-term facilities plan and recommends several school construction and renovation projects that could be funded through a bond program. Thursday’s meeting, scheduled for 2 p.m. in the Board auditorium of the Hattie Mae White Educational Support Center (4400 West 18th Street), is for discussion purposes. No action is expected to be taken on a possible bond election until July or August. The next possible date for a bond election is Nov. 6, 2012. School construction and renovation work approved by Houston Independent School District voters in 2007 is nearing completion on budget. So far, HISD has opened 16 new or replacement schools under that bond program, 6 more new schools are under construction, and 2 more are in the planning stage. More than 100 HISD campuses have undergone renovations so far. Click here for more detailed information about the work completed under the 2007 bond program. Thursday’s report will be presented by representatives from Parsons, an engineering, construction, technical, and management services firm hired by the district in March to update the comprehensive facilities assessment that was conducted in 2007. The board workshop will be carried live on HISD’s website and on the HISD Channel, which can be found on Comcast Channel 18 or AT&T Channel 99. This entry was posted in Uncategorized and tagged bond, Facilities, report on June 18, 2012 by HISD Communications.